In the 1950s the BBC was dead scared of any possiblity of advertising. I might say almost paranoid about it. In television, even the showing of film studio logos - such as 20th Century Fox and Warner Bros openings was banned and they had to be cut off. One of the projectionists in the Lime Grove Dubbing Theatre had the job of doing this. It even extended to the sponsored documentary films often shown in those days. I was rather upset about it and got up near the end of the film and asked someone else to do it..... That didn't go down too well. I thought it was stupid, and I have to say that in the course of time I seem to have been proved right. These things do go on the air today, and have done so for many years now. However one thing I did agree with at the time was the decision in 1956 to cut the end of the 1940 Hitchcock film Foreign Correspondent. 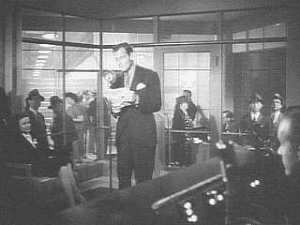 The film ends with Joel McCrea broadcasting to America from a completely un-BBC-like yet supposedly "BBC" radio studio! However in later years this film has been shown - and by the BBC! - uncut..... Times change, don't they! At first I resisted, thinking this was not justified as I had no intention of leaving the Corporation, but the "management" informed me that it was either that, or "goodbye".... I signed.